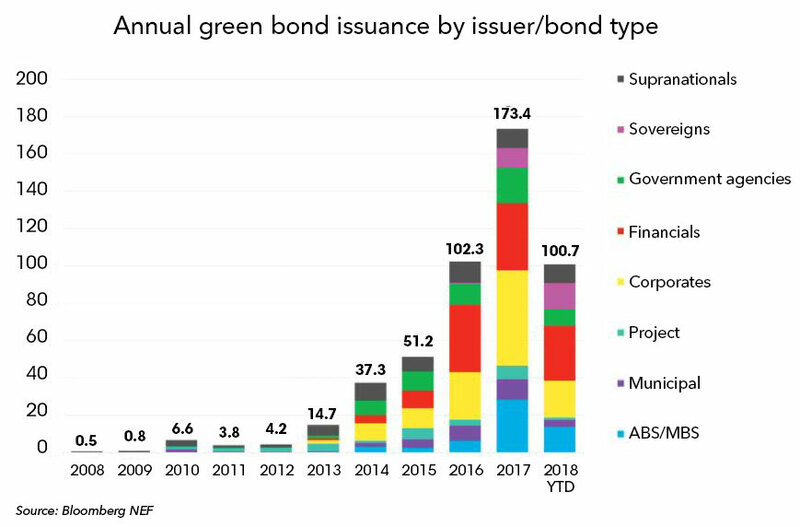 The Bloomberg NEF Green Bonds Tool has recorded total issuance of $100.7 billion so far in 2018. August was the quietest month in over two years, so issuance will have to increase significantly for last year’s $173 billion record to be broken. The Belgian government issued the largest green bond in 2018 at $5.5 billion, second only to the French government’s green OAT. Overall, the increase in European sovereign issues has helped the region gain a 42% market share this year. Green bonds are fixed-income instruments, the proceeds of which are applied entirely for green activities that promote climate change mitigation, adaptation or other environmentally sustainable purposes. To obtain a green tag on the Bloomberg Terminal, the issuer or underwriter must demonstrate that 100% of all proceeds will be used for acceptable green activities. BNEF clients can see the full “2H 2018 Corporate Energy Market Outlook” on the Terminal or on web.